We offer a full garden maintenance service. 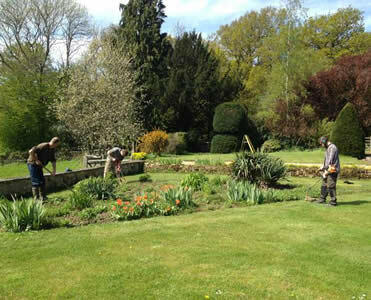 We are extremely committed to keeping the garden looking like you want and are punctual, hard working and knowledgeable. We offer a full service to all residential and commercial customers. Using qualified gardeners and state of the art equipment we can come and maintain any size garden or grounds on a regular or as a single visit. We are very skilled in clearance jobs, thoroughly clearing a garden but keeping all the shapes and plants that can be used in a future design. We are also very experienced at developing a garden while maintaining it. Once we spend a good amount of time in a garden we get lots of ideas that we are happy to share with you. We can tailor a maintenance service plan to suit you, whether you need a one off garden tidy or regular full garden or grounds management, our expert knowledge will ensure your lawns, plants, shrubs and hedges are appropriately cared for leaving your garden looking its best at all times. Grass feeding, moss reducing, scarifying, aerating and cutting including strimming and edging. weed control, hoeing, shrub planting and pruning and planting of perennial borders. garden clearances, composting, leaf clearing, tree surgery, soil improvement, weed control/spraying driveways and pathways, driveway/pathway pressure cleansing, pond maintenance. we also offer an advice service where we can walk with you around the garden and give you any information you need about how to maintain your garden yourself. Glorious gardens has maintained our garden to an impeccably high standard and have also developed our garden with impressive, appropriate garden designs"